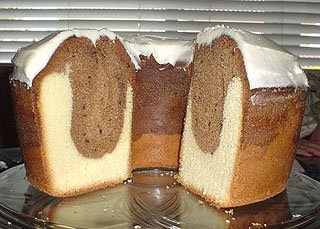 Here's a recipe for my favorite marble pound cake which is flavored with almond and coffee. The buttercream icing is not included in the original recipe below; but just something I wanted to try. The cake is delicious both with and without it. PS. Lillian was a woman I worked with several years ago in Philadelphia. She made this cake for all our office functions. Preheat oven to 350. Butter 10x4 tube pan and line bottom with wax paper. butter paper and dust with flour. In large bowl cream butter. Beat in vanilla and add sugar gradually. Beat on moderate speed for 2-3 minutes scraping bowl. Add eggs 2 at a time beat after each addition until thoroughly incorporated.On lowest speed add flour very gradually,continue to scrape bowl. beat only until incorporated. Remove 1/2 (5 cups) and set aside. Mix the almond into the remaining and turn into pan. level top by rotating pan briskly back and forth. Pour evenly on top of white batter level. Cover pan with tin foil. Bake for 30 minutes open door just enough to remove foil. Continue baking another 1 hour 20 minutes. Cake is done when tester is dry. Cool for 10-15 minutes in pan. cover and invert to remove pan and paper. Invert again to finish cooling. Mine always gets too mixed together! Nice and dense, just the way a pound cake should be! It stands so tall too!